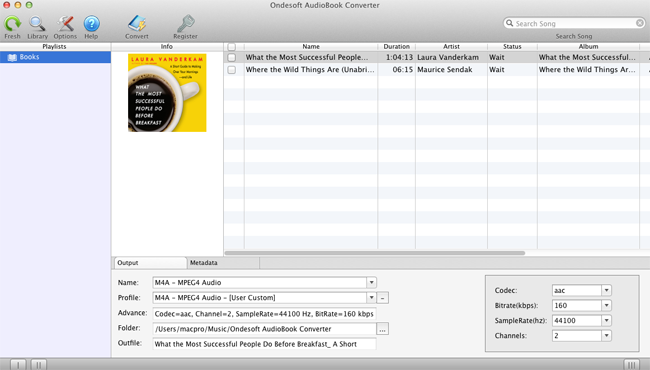 Download the free trial version of Audible AudioBook Converter here and install it on your Mac. 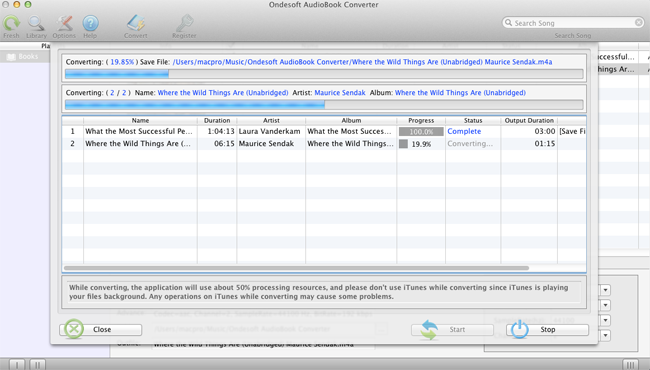 The trial version allows you to convert 3 minutes for each audiobook. Get the full version to remove the limitation. As we can see, all audiobooks on your iTunes Library of Audio Book are listed here. 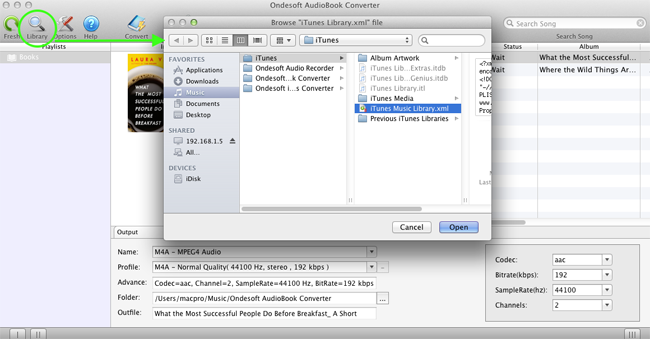 You only need to select or search audiobooks you want to convert instead of adding them manually. Batch conversion is supported. Format: choose one from AC3, AAC, AIFF, AU, FLAC, M4A, M4R, MKA and MP3. Profile: each format comes with several profiles; if you need a special one, configure codec, bitrate, samplerate and channels on the right side. If you want to save them, click "Options" – "Advance". 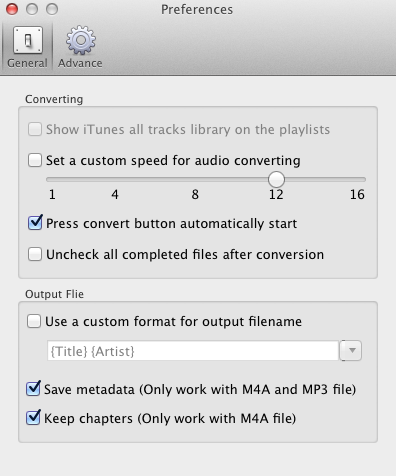 Folder: a default folder to save your converted Audible audiobooks is auto-generated, but you can change it. 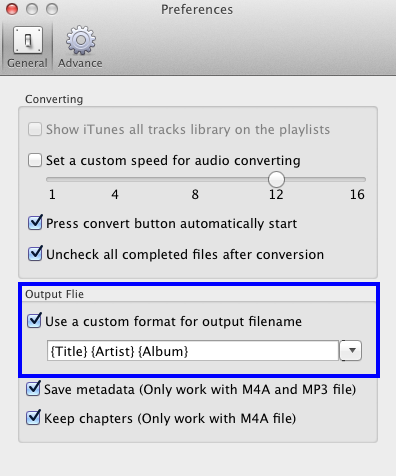 Outfile: means the name of the converted Audible audiobook, the default name contains Title and Artist of the AudioBook, click "Options" to set a custom format for the filename. Metadata: here shows ID tags of the selected Audible audiobook, including Title, Artist, Album Artist, Album and Genre, and you can change them. 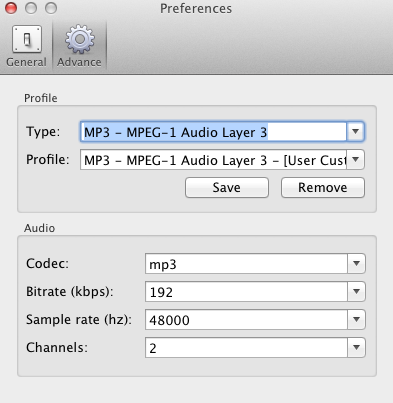 Preferences: click "Options" button to display the Preferences panel, where you can change the conversion speed – from 1X to 16X; set filename format; choose to save Audible audio book metadata and chapters and other options. After all these settings (actually in most cases, you need do little), click "Convert" button to start converting Audible audiobooks. 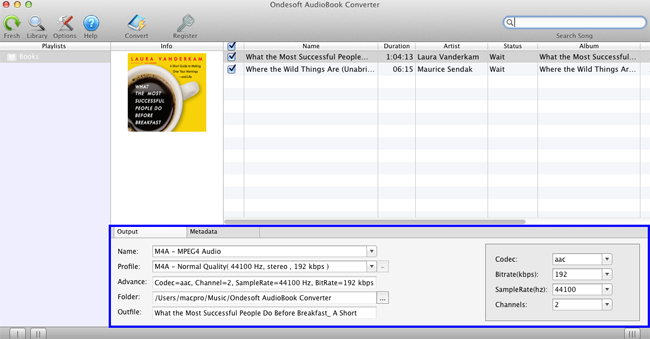 After conversion, go to the folder and find the DRM-removed Audible audiobooks. Fresh Button: you cannot add Audible audiobooks to this AudioBook Converter directly, if you have Audible audio books which are not in your iTunes library, you should add them to iTunes first and then click "Fresh" button. 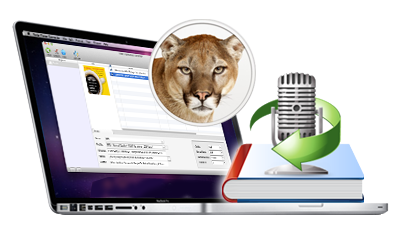 Library Button: if Audible AudioBook Converter for Mac cannot obtain your iTunes audio books, it may be because the iTunes Library.xml file is not in the default location. Click "Library" button to find it.